If you liked this show, you should follow NFOTUSA. 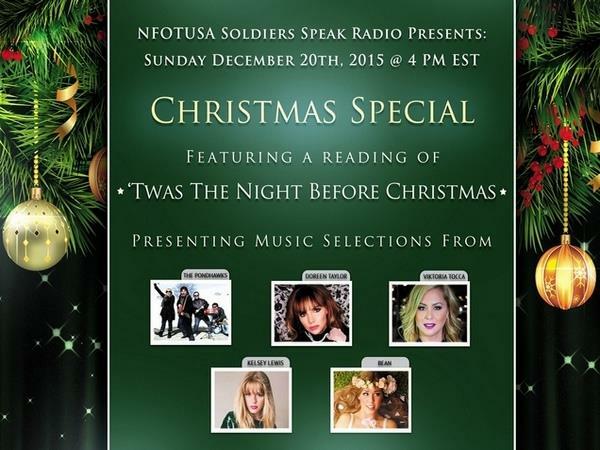 Join us on Sunday December 20th, 2015 @ 4 PM EST for our annual Christmas Special Edition show. Our gift to all the troops, our listeners, and your entire family! On this years show we will be featuring personal Christmas messages to the troops from our listeners and ends with the reading of the famous poem of Santa’s magic ride. Also on this year's show we will be featuring many selections of Christmas music from several of our previous guest artists with their original songs. These music artists include - Doreen Taylor, Viktoria Tocca, The PondHawks, Bean, and Kelsey Lewis. Don’t miss opening our gift to you on 12/20/2015 @ 4 PM EST and also after in archive. So join us along with your loved ones and gather round. We thank you for all your support and joining with us in supporting the great men and women of our military. We wish all of you a very Merry Christmas and a Happy New Year from all of us here at NFOTUSA Soldier’s Speak Radio! Our message to the troops: WE do what we do, because YOU do what you do.